Further evidence of the choppy housing recovery, existing home sales rose less than analysts expected in February. The National Association of Realtors said members sold an annual rate of nearly 4.9 million houses, up 1.2% from January and 4.7% ahead of the year-ago pace. The trade group continued to blame a tight inventory on slow sales growth and rising prices. Severe weather in the Midwest and Northeast also had an effect. The annual sales rate of new houses rose 7.8% in February, the fastest pace in seven years, the Commerce Department reported. As a result, the supply of new houses for sale fell to its lowest level in nearly three years. The bulk of the sales gain came from the Northeast, where real estate sales have been hampered by extraordinary winter weather. The broadest measure of inflation remained subdued in February, allowing the Federal Reserve to stay patient in its plans to eventually increase interest rates. On a monthly basis, the Consumer Price Index rose for the first time since October, with the first increase in energy prices in eight months, according to the Bureau of Labor Statistics. Year-to-year, the index was unchanged after a rare decline in January. 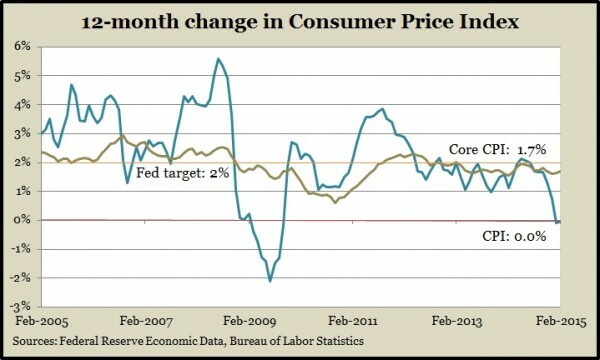 After taking out the volatile fuel and food prices, the core CPI still fell below the Fed target of 2%. A measure of U.S. manufacturing strength, durable goods orders, sank unexpectedly again in February, reflecting a global economic slowdown. The Commerce Department said commercial aircraft orders led the decline, but orders excluding the volatile transportation sector also dropped – for the third month in a row. Orders for non-military capital goods excluding aircraft fell for the sixth month in a row, a sign of weaker investments in business equipment. Employers continued hanging on to workers for the most part as the moving four-week average for initial unemployment claims declined for the second time in three weeks. The Labor Department released data showing average claims still above an 11-year low reached in November, but it consistently has stayed below the 48-year average since the end of 2013. The U.S. economy grew at a 2.2% annual rate in the last three months of 2014, down from a brisk 5% in the third quarter. In its final estimate of fourth-quarter Gross Domestic Product, the Bureau of Economic Analysis said the rate of consumer spending rose at 4.4%, the fastest pace since the beginning of 2006 and above the 30-year average of 3%. The report also showed corporate profits before taxes falling for the first time since the recession, while the Fed’s preferred inflation indicator remained below the 2% target. Consumer sentiment slipped in March as higher gas prices and severe winter weather chilled confidence particularly among low-income households. The University of Michigan reported that expectations dropped more than opinions about current conditions. For the first quarter, though, consumer optimism reached its highest level in more than 10 years.